Scooby Doo or Scooby Don't? This photo, every time I come across it, is my reminder that all successful gardens are personal expressions solely for the enjoyment of the gardener and no one else. This "garden" was on the Blackrock Riverside Tour of Gardens. 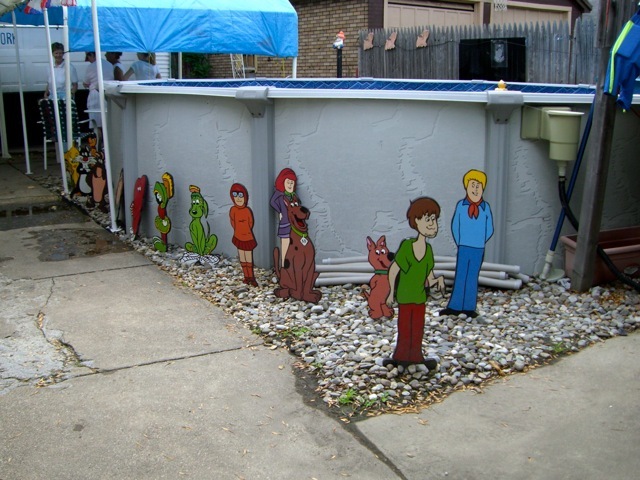 Would I take every square inch of my backyard and put in an above-ground pool, with white marble chips as a surround, then stick in Scooby Doo and Warner Brother's cartoon characters? Never in a million years. But when the owner was showing me around she told me that the whole backyard was put together for her grandkids and they LOVED coming to grandma's house. She even looked wistful, as if she'd rather be with them than showing garden snobs around her yard. THIS should be a prize-winning garden design because it elicits the exact visual & emotional result the garden designer intended -- the grandkids look forward to visiting grandma. I'm certainly with you on "never in a million years" but that's what's right about his beautiful country of ours... the right to choose. I agree that beauty is in the eye of the gardener, and anytime a homeowner is excited about and has pride in the outdoor space they've created it is to be celebrated. What I don't forgive is uninspired selections from garden tour committees. I LOVE going on garden tours and try to support as many as I can in my area. But time and money are limited, and the last time I spent $25 and all afternoon on a tour that featured many lackluster gardens was exactly that, my last time attending. I agree with you and with Laura. People should be free to do what they want with their own yards, and I especially dislike HOA codes that try to make cookie-cutter neighborhoods. More power to this woman for creating a place of joy for her grandkids. However, I don't necessarily think originality makes for a good tour garden, especially if one had to buy tickets for it. I, too, would be disappointed if I'd paid for a garden tour and this was among them (especially if I travelled to get to it). But the culture of garden tours in Buffalo seems to be a bit more democratic and open, with few (if any) garden criteria for participation (and we have 17 garden tours!). Very few charge This tour didn't charge. As president of the largest garden tour in the country, I do hear this on occasion. With Garden Walk Buffalo (which is free), there are probably 100 great gardens worthy of a paid private tour, 100 or more that are nice gardens worthy of a quick visit and about 100 or more that you wonder why they entered. But they're all near each other, generally in walking distance, so the spectacular gardens overwhelm and nominal gardens are quickly forgotten. The effect also, over the years for us, is that the numbers of each keep increasing as people improve their gardens. The vibe for our particular tour is a bit different than paid tours. When I do hear these complaints (and there are very few) I ask if they'd like their money back. Loved the personal investment in this garden but probably glad she's not my neighbor. Really enjoyed your long reply to the comments.